Challenge: Study the photograph below and take notes of what you learn from it. Explanation: Not every photo is worth a thousand words, but this one could inspire a book. I will be brief and let the image speak for itself. The man in a suit is Michigan State Spartans’ college basketball coach, Tom Izzo. The young man is Matt McQuaid, one of team’s players. In this challenge, you will first take a hard look at this photo for a few minutes. Do it in some place where there are no distractions, with pen and paper handy (or whatever you use to write). While you analize the photo, some thoughts will come up. Write everything that stands out and comes to mind. Initially, do not worry about the order the thoughts come or whether they make sense or not. Just write. Why have these thoughts stood out for you? 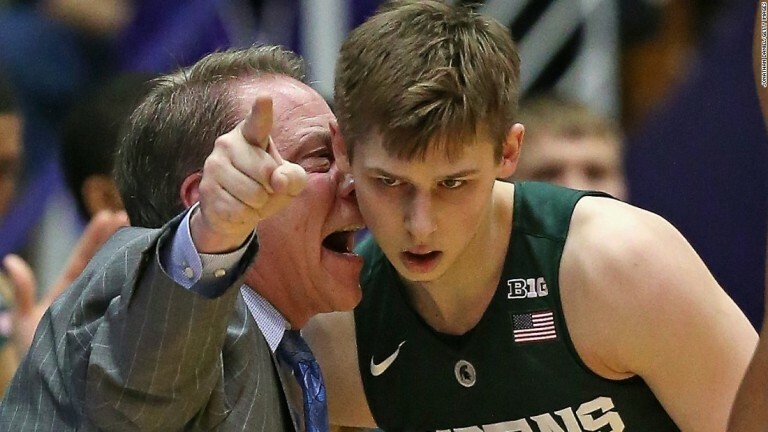 What do you think about coach Izzo? What do you think he is doing? How do you see the way he speaks to Matt? What do you think about Matt? What could be going through his mind at that moment? How do you perceive his reaction? What could men particularly learn from what we see in the photo? Concluding your analysis, what lessons can you learn for your own life? What can you do for these lessons to become a part of your life? Notebook: Write down your thoughts, the answers to the questions above, the lessons learned and what will you do about them — at least one change or attitude. Then, watch this video with my reflections (12 minutes), but only after you’ve written your notes down. Official Buddy: Talk about this challenge, exchange experience and conclusions. Deadline: This challenge can be started immediately and concluded in 28 days, before challenge #3. ☐ I have studied the photo and thought about it. ☐ I made my notes in my Workbook. ☐ I have watched the suggested video. ☐ I spoke to my Buddy about this challenge. ☐ I posted my comments on Facebook/Twitter.